So, there's two ways to look at this. One would be to gawk at the fact that ESPN, the worldwide leader in sports broadcasting, is using iPads and Xbox 360 consoles -- common devices that are widely available to mere mortals -- to drive content to millions of consumers. Another would be to gawk at the fact that ESPN has somehow managed to keep its finger on the pulse of innovation, despite being swallowed by Disney and being a part of one of the planet's most monolithic corporations. Thankfully for you, we're going to cover both angles here. Our eyes were opened after stepping foot in the company's Bristol headquarters and really getting a feel for how the company views technology and its integration into programming, and it led us to a philosophical conclusion about how corporations should (but oftentimes aren't) be taking advantage of what's readily available. Ready to get schooled? Head on past the break. As part of our ESPN walkthrough in the shooting of a forthcoming Engadget Show segment, we stumbled upon a telestrator demo that involved the use of Apple's newly released iPad to control on-screen graphics, overlays, doodle input, shading, etc. If you've ever witnessed a sportscaster break down a play on ESPN by freezing the frame, marking up the screen and pointing out details in the shot using a variety of red lines and highlights, then you know what we're getting at. The tool used to decorate the display is dubbed a telestrator, and needless to say, the multitouch iPad has enabled ESPN to place a bevy of new options into the hands of its hard working analysts. There was also an iPod touch alongside of it for times when an iPad would be too bulky, but the solution generally ran as such: a VNC client was loaded on the iPad (and iPod touch, for what it's worth), and the outfit's Windows XP-based control interface was beamed over WiFi for use on the set. That's it. Staggeringly simple, yet incredibly effective. The in-house network enabled the WinXP boxes and the iDevices to interact seamlessly, with absolutely no perceived lag. 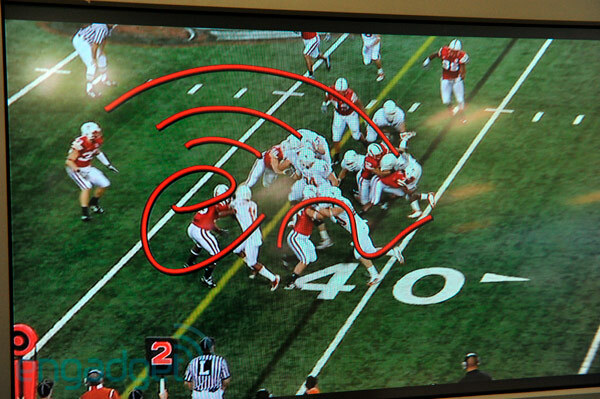 We were able to toss an Engadget logo onto a Nebraska freeze frame with ease, and we're crossing our fingers that it makes the cut once college football season kicks off later in the summer. The wildest part is that ESPN is actively using the iPad and iPod touch to dictate screens on live telecasts right now. As in, today (Junior). The iPad has been out for just over two months, yet somehow ESPN -- a massive corporation that should technically have all sorts of red tape bogging down this type of forward thinking -- has managed to not only get a setup working in its labs, but actually get the new setup working and onto shows that we're enjoying each and every day. Let's try reiterating this another way: a broadcasting company that is oft hailed for having some of the best graphics and on-screen technology in the universe is using the same tablet that you gave your mom for Mother's Day to do it. No proprietary hoopla, no overpriced / underpowered PDA from yesteryear -- just an average iPad that any Joe or Jane can pick up today and shoehorn into their life. Going from purchase to live-on-the-tele in two months is no small feat, and ESPN deserves a massive amount of credit for being both quick on its feet and ambivalent to the usual pressures of corporate acceptance. As for the Xbox 360? It's being used for similar reasons. Put simply, ESPN's techies have no interest in wasting months and years creating proprietary IP that they could theoretically sell to others in the future. Instead, they're interested in serving the fan, and serving the fan involves using whatever tools are readily available in order to push the envelope faster than the competition. Each of the Virtual Playbook segments that you see on ESPN relies on just a couple of things: a developer Xbox 360 (slightly modded for integration into a broadcasting company) and a copy of an EA Sports title. Oh, and that same iPad to highlight players as the virtual play unfolds to viewers around the world. Just think about that: instead of waiting eight years for Pixar to create some sort of crazy new graphics scheme to let ESPN build their own plays and discuss them on-air, these folks picked up a $200 game console and started banging away on the code to make it happen. We were also briefed on a forthcoming motion capture system that'll allow the network to show how high a skateboarder (and eventually, a snowboarder) is rising in a big air competition... in real time. And we're not talking about some guesstimating solution; we're talking about embedding tracking tags onto the bottom of decks and using an array of simple, off-the-shelf object tracking sensors to show how high a skater is going as the trick unfolds. The real kicker? These tags are the same ones used by logistics companies to manage inventory in warehouses, and ESPN's primary test subject is an unused office chair with tags strapped to the arms. You may laugh, but what this proves is that ESPN is still thinking like a startup and using whatever is at their disposal at the moment to beat the competition to the punch. Can you imagine the progress we'd see if major software vendors, standards makers and hardware manufacturers took a similar approach? Folks, it took seven years for the 802.11n draft to be "certified." It'll take ESPN fewer than a dozen months to change the way the world views new heights set by X-Gamers. Upon talking to those involved with the projects discussed here, we got the impression that the bigwigs basically let the technologists run their own show (within reason, of course). They understand that ESPN wouldn't be anywhere near where it is without its innovating approach, and by letting the kids in the sandbox play with whatever toys they can get their hands on, the entire network is able to reap the benefits. Somehow, ESPN is able to be nimble in a world that's too often bogged down by authorization meetings and endless approvals by executives who have no idea what's truly going on. We can't count the times we've questioned a company on what's obviously a boneheaded decision, only to be told that focus groups and fancy algorithms assured them that the public would love it. If more companies would stop overthinking things and start having fun, we're pretty confident that we'd see more innovation, more discovery and less waiting for the next big thing.